Fostering behavioral change in young people in order to create a responsible drinking culture & a safer healthier community. The Thomas Kelly Youth Foundation reduces alcohol-related violence and anti-social behaviour amongst young people in Australia by raising community awareness and contributing to the formation of government regulation and industry practice to lead to behavioural change. The Thomas Kelly Youth Foundation raised $62,100 at that Funding Network event, and used this money to initiate the Take Kare Safe Space program in Sydney’s CBD, which operates every Friday and Saturday night between 10pm and 4am to help at-risk young people who are out in the city - decreasing incidents of violence and sexual assault, and helping people get home safely. 17-year-old Thomas Kelly’s death by a ‘one punch’ attack made headline news in Australia in 2012. A conversation started, largely instigated by Thomas Kelly’s family, about the misuse and overconsumption of alcohol in Australia leading to widespread violent behaviour. It eventually lead to NSW’s ‘lockout laws,’ which have been implemented across the Sydney CBD. Thomas’ father Ralph Kelly pitched the Thomas Kelly Youth Foundation to the Funding Network on 10 March 2015. He told the audience about the profound effect of his son’s death, and expressed his desire to ‘break the cycle’ of alcohol-fuelled violence in Australia. He said the foundation was “not about violence, but about teaching our youth responsible drinking.” It’s aim was to create long-term behavioural change in the community that would benefit generations to come. 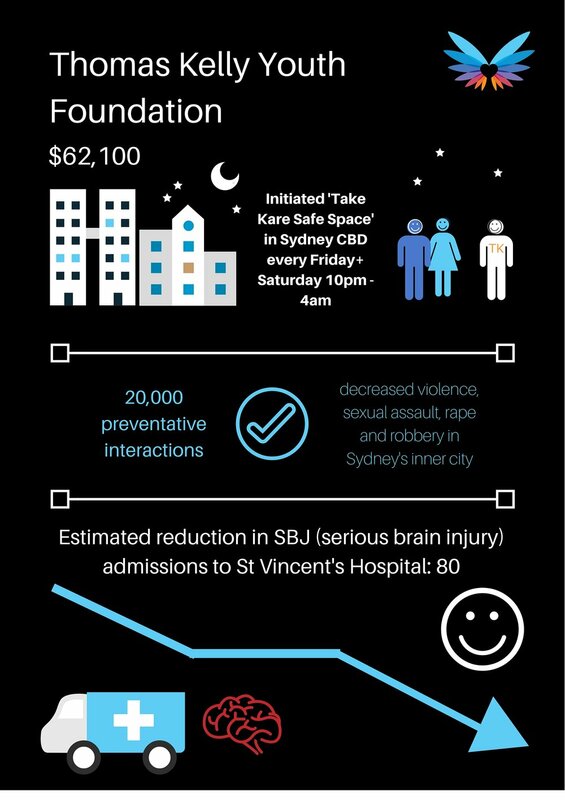 The foundation has successfully reduced alcohol-related drain of resources in NSW hospitals, reporting that there have been only three admissions for serious brain injury to St Vincent’s hospital since February 2014, which is 80 admissions less than previous figures, saving the community over $400 million. More importantly, at least 80 young people like Thomas have gone safely home to bed. Learn more about Thomas Kelly Youth Foundation.